hi there . many thanks for the reply, I saw it yest but didn’t have opportunity to reply. ok couple of things id like to address in your reply if I may. in regards to the gui, if a skin has turned the sounds off, then the sounds can be switched back on. what I am saying there is that for those that require an actual noise, the gui can provide that, with a few choices of more pleasant sounds. Also, a user can see something is occurring with a button press by something happening on the gui, without sound. that’s his/herconfirmation. if I were to use another medium as an example, a huge bugbear for most humans is people who leave their keypad tones on on their phone, especially in confined group situations. so in summary, I feel its unusual to have a clicky av remote, certainly one that would be integrated with OSK,s and I feel your vero 2 would have greater success if the buttons could be quietened a bit more. repetitive audible clicks in any sitiation will eventually irk, a little like taps dripping. I will keep this in mind for future batches. Re. volume keys – where would you want them placed on the current remote, and which (if you had to) buttons would you be happy to lose to have them? Oups did not see this thread. Very interested in a dedicated remote for osmc in order to help development. i hope to use my raspberry pi 2 for quite some time. As other users highlighted this remote is a little bit too simple for my use case. I would like the remote to completely replace my samsung Tv remote. So be able to turn tv on or off. Mute and adjust the volume easily. I am not sure about keyboard on the back but an integrated gyroscope and a game pad on the back would be very handy if osmc gets a retroplayer integration. Just recieved the new remote in the post. Chuffed to bits now. Does exactly what I need it to do. Hi Guvna, that is great to hear. I was disappointed when I hooked up my remote to see no volume controls. I unfortunately didn’t look closely at the product photo because I simply didn’t imagine it not having that control. I use play, stop, fast forward/rewind, direction controls, ok, and volume. Those are the main needs. If the control could pull some sort of on screen display function to access volume control- I would be satisfied for now. I would say the info button isn’t super necessary. The home key isnt 100% necessary either. Home can be reached via stop button if watching something, or the back key if in another menu. So If you had to have the same amount of buttons, thats where I would put them and what I would replace. I would still want access to an on screen display to be able to turn on and off subtitles, or access information, or search. Given your wants, it is, indeed, a pity you didn’t look at the photo to see what controls were supplied. You can remap controls, to some extent, and you can make it context dependent. There was a thread, either in these fora or in the kodi.tv Pi forum on how to install an onscreen set of volume controls - this you might find acceptable. You can swap two buttons you are not using to perform the volume function if you would like. What device do you want to run this on? A FireTV? It should work, but a couple of buttons might need remapping. I think @actiona has a Fire TV stick and may be able to test the OSMC remote with it. Yes, with the FireTV, although I’m finding that no matter what remote I try, FTV & Kodi functions seem to be “mutually exclusive”. My goal was to have one box that can handle Netflix,Amazon Prime & Kodi, and so far the FTV is closeset. I have tried remapping scripts for the FTV remote, but they still don’t do everything. I’m resigned to having to use 2 remotes, & really like the look of the OSMC one, so wanted to check if it could be used in this setup. I would expect all buttons to work out of the box except for the Context Menu and the Info button. @dbmandrake has a Fire TV Stick. I’ll ask him. I don’t think the stick has usb ports, the box does. What buttons do you miss when using the FireTV remote in Kodi? I honestly have no use for others. @DBMandrake says the stick has no USB ports, so our remote is a no go unfortunately. 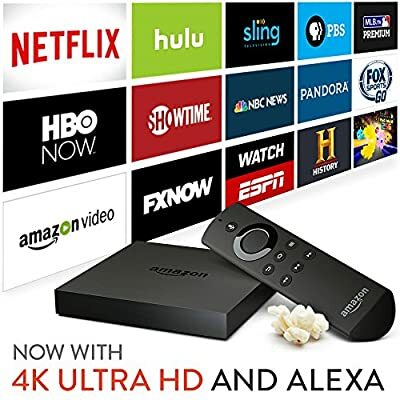 Below is an Amazon FireTV. This second generation (primarily denoted by 4k support) is commonly referred to as AFTV2. OP does not have a stick (by my reading) and does in fact have a USB port.